One of my favorite activities around the holidays is baking cookies. I'm already gearing up for the next few months cookie baking, and planning on hosting a cookie exchange this year. A cookie exchange allows me to make several dozens of one recipe of cookies, and get together with other people, and swap out my cookies for theirs. This lets me have tons of different types of cookies, with only one afternoon worth of work. 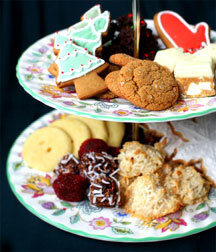 The swapped out cookies can be used to gift to others, as refreshment at your own party, or for your own indulging. What I love most about cookie swaps however, is getting together with friends and having a fun evening by laughing and forgetting all the other stresses that abound. Send out Invitations 3 weeks to a month in advance. Winter months fill up fast! On the invitation remember to include a specific amount of cookies to bring, as well as a printed recipe for each guest. If you are requesting that guests bring their own boxes for transporting cookies home, include that as well. Decide on your menu plan. I plan on serving a hot chocolate bar and finger foods to my guests. 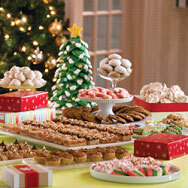 Obtain bakery boxes, tins, and packing supplies for cookies if you are not requesting guests bring their own. Even if you do request that they bring their own, have a few containers hanging around that you don't care if they disappear forever. You can get bakery boxes from a neighborhood bakery, often very cheaply, kitchen supply stores and craft stores also carry options. Other supplies you might want are twine, wax paper and cellophane. Before the party I plan on decorating the house festively, having plenty of seating, and preparing my light menu. I also plan on getting a gauge of how many guests to expect. Remind your guests who plan on attending with a gentle reminder the week of the event. The winter months get crazy and if someone forgets to set aside time for baking it might not happen, and then they might feel silly showing up. How does it work? Typically each invited guest brings six to a dozen cookies per invited guest (bring extra if you intend guests to sample). This is up to the host and should be stated on the invitation. When guests arrive, the cookies are spread out by type. It is nice to include a label of some sort stating the cookies name as well as who brought the cookie. Include printed recipes by the cookies. Guests start with their box, and go around, picking 3-6 of each type of cookie, and rotate through the line until all the cookies are doled out. You can also bring some optional desserts rather than cookies. Precut fudge, toffee, and almond bark, even prepackaged chocolate covered pretzels, or spiced nuts could be substituted. The rest of your party is all about gathering, noshing and mingling, and those things don't need directions. Have fun! 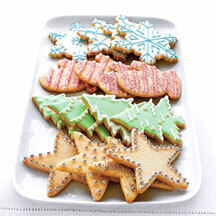 Cookie exchanges are a great way to provide sweet treats in large amounts. If you are throwing your own Christmas get together in December, this is a great way to bake for a large group of people very easily. Using Cook'n software can help you to multiply recipes easily, and make it very easy to cook a huge batch of cookies. You can watch a video on how that works right here: Scaling Recipe with Cook'n. 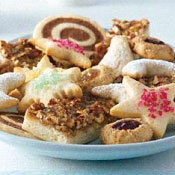 What are your favorite Holiday cookies? Please leave a comment to spur some ideas for other newsletter readers.